The fading had been beginning to pick up. Two weeks ago when I made the collage I had become a little disillusioned with the whole process, again. There was obvious fading but it wasn't as fast as I'd like. Since making said collage, I had noticed an increase in the fading. 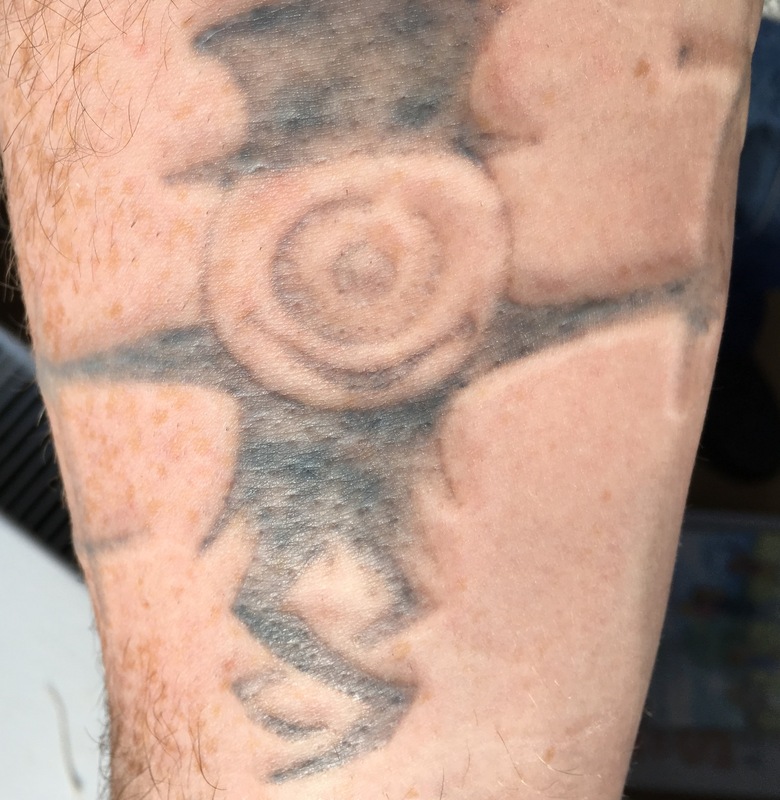 My wife thinks it obviously fading, I think as I'm looking at it every day it makes it less apparent. The above was taken this morning, about an hour before the session. Caveat, the light is good here so it looks more faded than it really is. It seems in good light looks quite faded, in bad looks quite dark. I judge more the bad light as my reference is the likelihood of someone noticing that I have a tattoo. In case you missed the picture, it's quite noticeable still. I'm genuinely not sure if I imagined it or if it faded quite a bit in those 10 days. To me it seems it did. The above was taken just after I got home, around 90 minutes after the first. You can see there is some swelling. It's definitely sensitive, has been shot with a laser, but not sore. I've put some aloe vera on it and will continue to do so. After last session it was so painful I felt I had to keep applying it, I think this will be easier. I expect the swelling will have gone by tomorrow and then the waiting begins. I think I'm going to take more time for the next session. I've noticed and it's widely documented that more time leads to more fading and better results. I'm thinking of waiting until June for the next session. The problem with this is that I've already paid and am keen to get what I paid for. I have another 3 sessions paid upfront. Waiting 6 months will mean another 18 months before finishing this pack of sessions, only then will I know if I need more. I'll see how I feel closer to the time. If I'm seeing noticeable results by May / June it will be easier to wait. 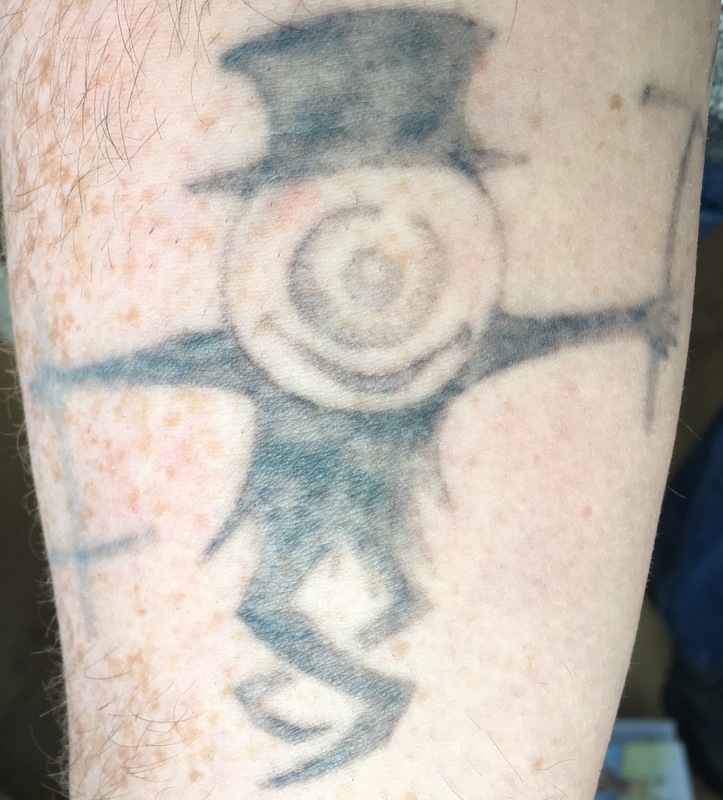 If the tattoo is still quite obvious, I'll want to laser that ink again.